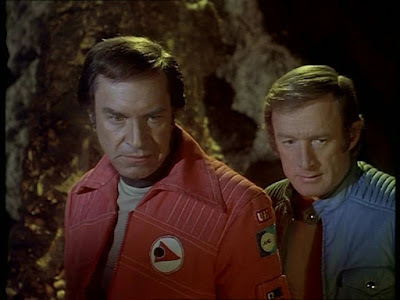 John Kenneth Muir's Reflections on Cult Movies and Classic TV: Breakaway 2018: "All that Glisters"
Commander Koenig (Martin Landau) leads a team to a nearby planet when Main Computer reports that the world possesses the rare and vital mineral called Milganite required for Alpha’s life support system. On the team to find and mine the Milganite are Dr. Helena Russell (Barbara Bain), Maya (Catherine Schell), Alan Carter (Nick Tate), Chief Security Officer Verdeschi (Tony Anholt) and geologist David Reilly (Patrick Mower), an Irishman who fancies himself a Texan cowboy. 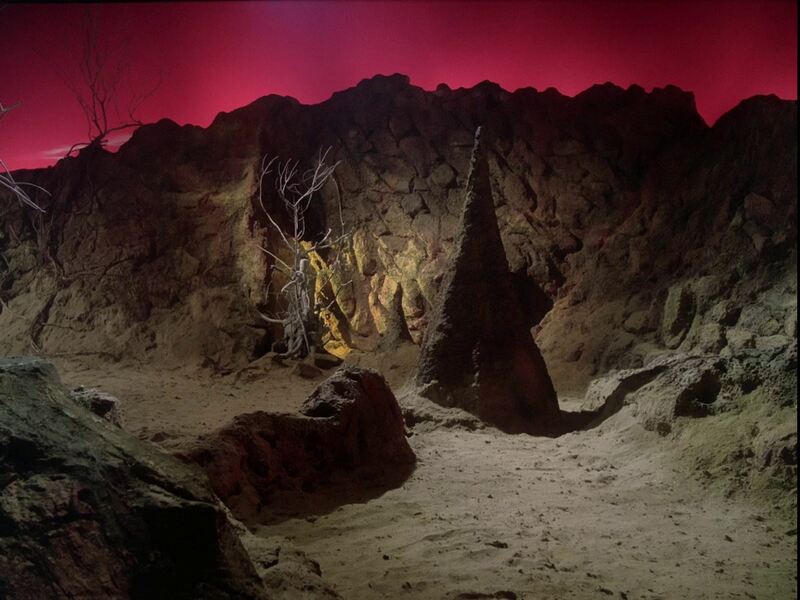 Once on the planet surface, the Alphans’ Milganite readings lead them to a strange orange rock in a cave. When Reilly cuts off a sample of it, it bleeds and utters a scream of pain. Upon the deposit of the rock in the Eagle, the rock flares energy, and apparently kills Tony. Helena determines, however, that Tony still possesses brain function, a fact which becomes apparent when Tony is “revived” to serve as the arms and legs of the rock sample, retrieving another piece of the glowing rock from the cave. 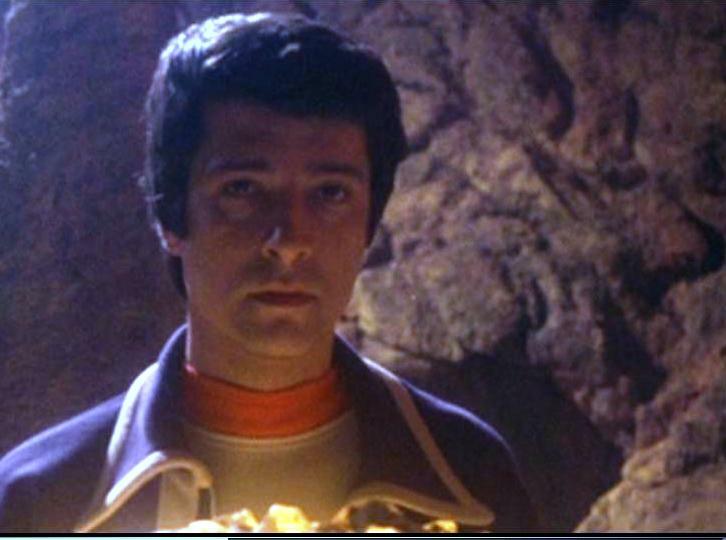 Koenig and the others soon recognize that the rocks on the planet are alive, and desperate. They require water to survive, and have been enduring a seemingly-unending drought. 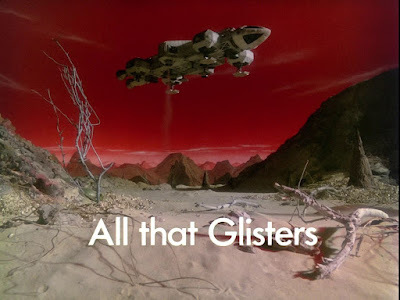 “All that Glisters” is a quite disliked episode by many Space: 1999 (1975-1977) fans, and also, actually, by some of those who participated in the making of it. Martin Landau’s displeasure with the script is legendary, and if you watch very closely, you can also see Catherine Schell breaking character and succumbing to fits of giggling, in a scene set on the planet exterior, as the rocks take control over the Eagle. She must turn away from the camera, once her composure fails. Well, there are a number of reasons, for certain. The episode, about a silicon-based life-forms, doesn’t treat the main characters, for the most part, in appealing or intelligent fashion. The guest star, Mower’s Reilly, for instance, is an “Irish Cowboy” and attempts a dreadful Texan accent. He is an obnoxious character, with little in terms of human qualities to make the audience like, or even care about him. He hits on Maya in the Eagle, to Tony’s dismay, and then constantly acts counter to Commander Koenig’s orders. He is obsessed with a living rock. So, an Englishman plays an Irish cowboy who is obsessed with rocks. That’s quite a description! Commander Koenig, a character I love and admire, also fares poorly in the episode. Perhaps because of Landau’s displeasure with the story, Koenig is constantly on the verge of catastrophic rage, shouting and yelling at his subordinates like a maniac. Worse, his orders sometimes make no sense. After Tony is injured by the rock, for instance, Koenig orders that no one go near, look at, or in any way interact with any rocks. Well, if they do that, how will they save Tony? How will they understand their environs? It’s a dumb order, and Landau should never have been put in the position of having to issue it. Dr. Russell also comes across poorly here. She has to say the line “I’m a doctor, not a miracle worker,” which, of course, comes straight from the lexicon of Star Trek (1966-1969) and its notoriously cantankerous physician, Leonard McCoy (DeForest Kelley). So Helena is a sort of cut-rate “Bones” here, frustratingly. So why did I give such a favorable review of “All that Glisters” in my book, Exploring Space: 1999 (1997)? And why do I still appreciate it? There are two reasons, primarily. First, I admire the episode’s photography. 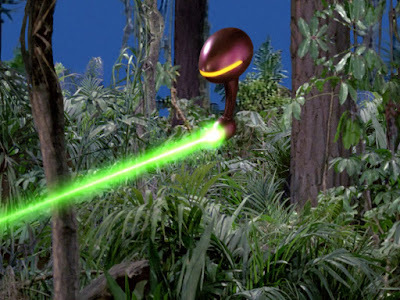 Much of the episode takes place in a darkened Eagle laboratory pod, as Helena and the others deal with the strange nemesis in their midst. These shots are beautifully-crafted, with dim illumination, and lights sometimes cast only on eyes, or faces. It’s stylish and smart in visual approach, and reminds me of black-and-white horror photography from Hollywood of the 1940s. The familiar technological setting is rendered almost “supernatural” in its creepy nature, and given that so much time is spent there, the episode also boasts a nice, claustrophobic feel. There’s a real sense here of an inescapable trap. 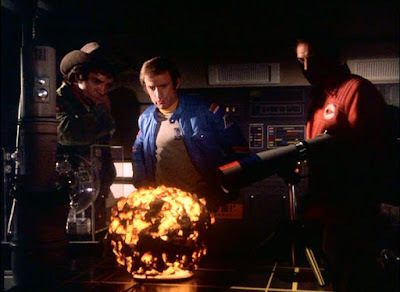 Secondly, and perhaps more important than the episode’s stylish photography, I appreciate how “All that Glisters” fits into my “horror myth” thesis about Space: 1999 overall. This conceit continued into Year Two. “The Exiles” was “The Picture of Dorian Gray,” at least after a fashion, and this segment, “All that Glisters” is very clearly a technological, space-age update of the traditional zombie story. Today, we primarly associate zombies with George A. Romero and The Walking Dead (2010 - ). They are dead creatures who feast on human flesh and typically transmit a plague to those bitten. But if you go back in Hollywood history to films such as White Zombie (1932) or I Walked with a Zombie (1943), you can see the interpretation of that monster that “All that Glisters” adopts and re-processes for the space age. Basically, zombies, in those situations are shambling, dead (or mostly dead…) servants of sorcerers or other puppet masters. The fear was of being made dead, and then a drone or slave to some horrible person and his agenda. Here, of course, the rocks destroy Tony’s consciousness and make him, operationally, a zombie: a creature without higher thought, but bound to their control. Again, there are some very good, atmospheric shots of Tony blank-faced, walking across the alien planet surface. He is lit from below (by the glow of the rocks), so that his vacant life-less face appears menacing and inhuman. 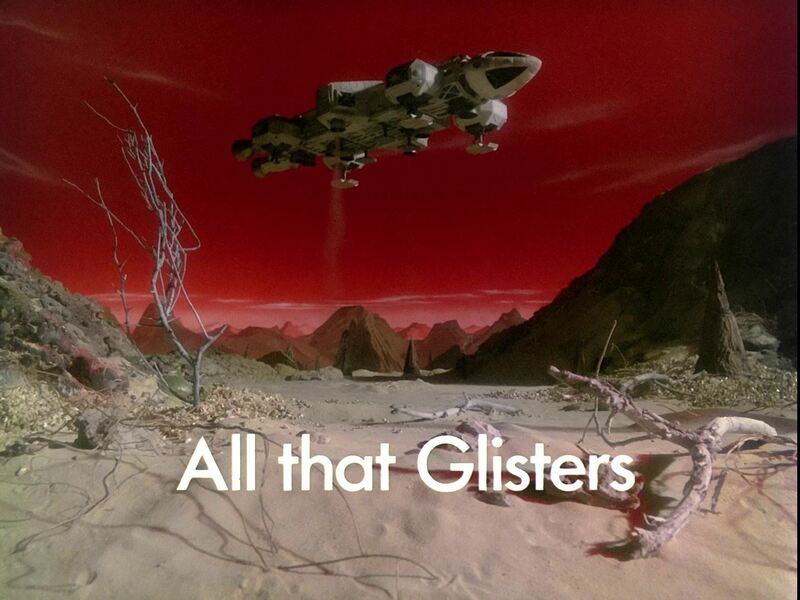 My grounds for admiring “All that Glisters” come down to, essentially, the horror touches, and the accumulation of their impact. The dark laboratory is a haunted house setting, and quite claustrophobic, thus generating anxiety. And the rocks make zombies of the living, turning them into trudging, mindless automatons, in keeping with the series’ overall horror qualities. Finally, I do think it is nice, after all the horror on display in “All that Glisters,” that the Alphans show their humanity and help the rocks to survive. Not so much because I want Space: 1999 to emulate Star Trek’s universe of brotherhood and optimism among alien species, but because it’s a different type ending for the series, and therefore it feels fresh. If the Alphans can help the rocks, it seems natural that they would do so. In all honesty, if I could burn the negative and all answer prints to this one, I would.